Arena Financing Primarily from bank financing, Delaware North (25%), City bonds and land (10%) and 2% ticket surcharge. Naming Rights Fleet Bank paid $30 million for 15-year naming rights in 1995. $10 million was paid upfront with the remainder to be paid over 15 years. Cancelled in 2005. TD Banknorth brought back the Garden name in 2005 when it signed a $6 million-a-year naming-rights deal. 1992-1995 - Attendance for 38 games in Boston Garden; does not include 3 games per year played in Hartford, Conn.
2012-2013 - Attendance for 40 games due to Boston Marathon Bombings Cancellation. The TD Garden (formerly the FleetCenter), a 755,000-square-foot sports and entertainment complex replacing the Boston Garden, was constructed above a new five-story, 1,150-space MBTA parking garage accessible from Nashua Street. Long-term TD Garden leases and contracts have been executed with the Boston Bruins, the Boston Celtics, Ringling Brothers Barnum & Bailey Circus, Walt Disney's World on Ice and the World Wrestling Federation. The TD Garden will continue to host the Beanpot college hockey tournament, the Boston Shootout, Boston Blazers lacrosse, and college and high school winter-sports competitions. In addition, the TD Garden will substantially increase the number of concerts on its schedule, adding from 25 to 30 shows per year. 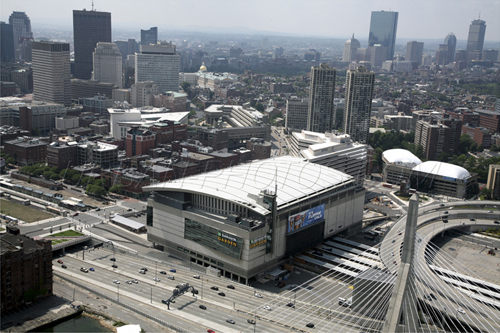 The TD Garden rises directly behind (north of) the Boston Garden and occupies a 3.2-acre development site. Base dimensions: 468 feet long (east-west) by 300 feet wide (north-south). The arena floor runs east to west. The TD Garden is built on air rights above the new North Station MBTA terminal and reaches a height of 162 feet, approximately the same height as 150 Causeway building (10 stories). 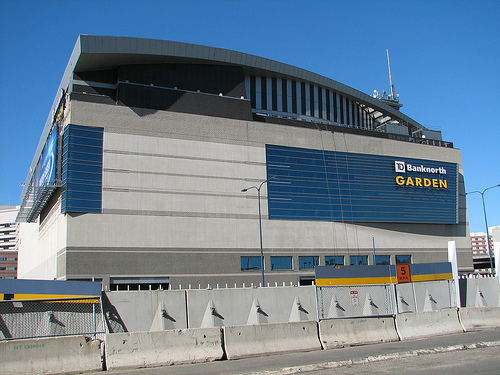 Site: The TD Garden occupies a 3.2 acre development site. The north face is a mere eight feet from Storrow Drive/Interstate 93. Dimensions: 468 feet long (east by west) by 300 feet wide (north by south). The arena floor runs east to west. Did You Know? : Typically most projects of this size and complexity require 30-32 months for completion, but the TD Garden took 27 months from start to finish, including overcoming a seven week delay in December 1993 because of record snowfall. 2 Full-service dining club areas. 3.2 Acres occupied by The TD Garden. 29 Months necessary to construct The TD Garden. 50 New permanent jobs created by the opening of The TD Garden. 162 Feet, the height of The TD Garden. 468 Feet, the base length of the TD Garden, by 300 feet wide. 700 Jobs filled during the construction of The TD Garden. 1,150 Parking spaces in the MBTA parking garage accessible from Nashua Street. 3,734 Additional seats available for Celtics' games than in the old Garden. 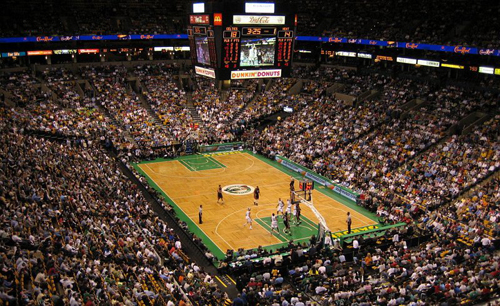 18,854 Seating capacity for Celtics' games. 755,000 Square feet, the total area of the The TD Garden sports and entertainment complex. The Boston Celtics have extended their lease at the TD Banknorth Garden through the 2020- 2021 season. In addition to the extension, the team will see improvements to the building and a chance to bring the NBA All-Star game to the venue in 2009 or 2010. The current lease expired in 2011. Team and building officials did not detail the upgrades, but indicated it would include new lighting, sound and scoreboard equipment. The Celtics will create a new Courtside Club for season ticket holders. In 2004, the Celtics sought changes in their lease to get more revenue from the building in which they play rent-free. Delaware North officials, which own the venue, began exploring other venues to see how they might upgrade the arena. The Celtics also hired Tim Romani to help them review sites and plans for a new building. The Celtics said they wanted money from building concession and premium seating operations. Club seats are sold by the building, which has struggled for years to create demand for the product. February 1, 2007 - Boston's Fleet Center opened in late 1995, replacing the aged Boston Garden, a hallowed ground for one of the Original Six NHL teams and home to that great Celtics dynasty of the 60's. The old Garden was located downtown atop the old North Station... the Fleet Center is built ON TOP of the new North Station. When you set foot into this building, you are immediately confronted with the mix of fans attending an event and commuters catching their train rides out into the 'burbs. Getting to the Fleet Center means driving up I-93. From the south and from I-90 you exit at Storrow Drive and turn left. From the north exit at Leverett Circle in Cambridge and follow the signs across the bridge. Traffic is a major headache in Boston so allow enough time as backups are frequent. Parking is also a chore here, little free street parking and most ramps and the garage under the arena charge anywhere from $18-$25 for event parking. Surface lots are few and far between. Another option is to leave your car at a park and ride lot, and take the subway or the commuter train, known here as the "T". Either way make sure you have a plan before heading out. Causeway Street runs directly outside the building, and across the street is a tightly wound neighborhood of city streets with a cornucopia of taverns and some memorabilia stores and souvenir shops, kind of like the atmosphere around Wrigley Field on a smaller scale. Special mention here to "The Fours" on Canal Street, an awesome sports bar and of the oldest in the country. And although Boston's historic landmarks beckon in other parts of downtown, one can find many historic North End attractions and historic Faneuil Hall, all within walking distance. As of 2005, much remains to complete the work on Boston's "Big Dig" project, so much of the area around the arena remains a mess of construction detours, piles of debris and shuttered overpasses awaiting demolition. Once completed, the neighborhood around the arena will be forever transformed for the better, with new roadways and open spaces for downtown parks. Very bright and colors are generally yellow and white. Since the arena is built on top of the rail station, one must take a set of escalators from the main lobby up to the arena lobby. After security check and ticket scan, you then take yet another long escalator ride, and that takes you to the 100 level concourse. There are many concessions with a terrific food selection and also several merchandise kiosks. The "West End Deli" offers sandwich wraps, pita sandwich even a lobster roll sandwich! We even fond a stand selling Buffalo wings that looked like the real deal. The main team store is located in the main lobby, off the train station concourse downstairs and is accessible from the inside or the outside. Available to club seats holders are two restaurants, Banners and the Premium Club, both offering upscale dining. The Premium Club offers a la carte items at different food stations. On the lower level is a membership only Sports Club, Legends, also offering casual dining. The unique thing about the club level is that it houses the Sports Museum of New England. The entire concourse is devoted to displays, memorabilia, interactive features and if you have tickets on this level, allow enough time to take it all in. This museum is also open on non event days and is a must see for the sports fan. Man oh man, if you like banners then you have come to the right place - both the Bruins and the Celtics have a long rich history and it is reflected in their many championship banners and retired numbers that adorn the rafters. Much of their success, however, predates the 90s, and today both teams are struggling to find their footing. What leaves us cold about the Fleet Center is probably the location. We like downtown sports venues, but with the Big Dig mess, lots of expressway overpasses around the building and abutting the Cambridge River, this is a tough place to get to and to get out of, parking is scarce and expensive, and the configuration of the arena suggests that this is a rail station first, and a sports venue second, as in almost an afterthought. Of course the old Boston Garden also sat atop the former North Station, so this is just the way it is here. Still nice amenities, sports museum is outstanding, and a venue with a pretty seating bowl and clean and bright concourses, so the end result is we rank the Fleet Center in the middle of the pack. The Boston sports arena will be officially rebranded TD Garden, shedding its Banknorth middle name in July. It's the fourth moniker for the venue since 1995, and the move comes as banking giant TD Banknorth prepares to change its New England operations to TD Bank. The new name for the Garden, home turf for the Celtics basketball team and the Bruins hockey franchise, is supposed to stick through 2025. The rebranding will cost upwards of $1 million and involve changing the outdoor signs, installing new templates for the ice logo, refinishing the parquet basketball floor, and replacing small details such as business cards.